With other parameters remaining the same, as the lift generated by a body increases, so does the lift-induced drag. 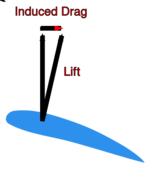 For an aircraft in flight, this means that as the angle of attack, and therefore the lift coefficient, increases to the point of stall, so does the lift-induced drag. At the onset of stall, lift is abruptly decreased, as is lift-induced drag, but viscous pressure drag, a component of parasite drag, increases due to the formation of turbulent unattached flow on the surface of the body. With other parameters remaining the same, induced drag increases as the angle of attack increases. This page was last edited on 6 November 2011, at 21:41.